A random lightning strike frees Doctor Emile Dorian from Arkham. He strikes out intending to get revenge upon Batman. His first stop: enlist the aid of Doctor Kirk Langstrom as Man-Bat, whether Langstrom wants to or not. Meanwhile, Anthony Romulus seeks out Dorian, looking for a cure to his lycanthropy. He encounters Tygrus, Dorian’s cat-man creation. Together they agree to look for Dorian, so long as Romulus takes Tygrus to meet Selina Kyle. Back in Gotham, Man-Bat demonstrates his strength by slamming the Batmobile off the road, ripping off the roof, and kidnapping Batman. 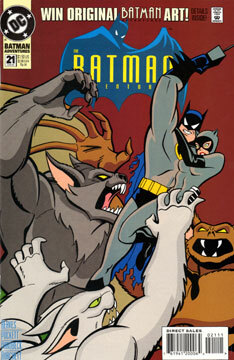 Later, while Romulus and Tygrus re-evaluate their plans, they see Man-Bat flying off with Selina in tow. They pursue. Soon, all the players are in place at Dorian’s lab. He offers to transfer Tygrus mind into Batman’s body, and vice versa. Tygrus accepts, as he wants to be human, and Dorian wants Batman to be as strong as possible for long sessions of torture. Romulus then attacks as the werewolf, and the giant monsters have at it. Batman escapes with Selina, and the building explodes, leaving the fate of the monsters and Dorian in question. Not a bad issue. I always enjoy a well-crafted story in which multiple villains or characters are brought together. You never know what they’ll do! Using Dorian as a premise to bring the “monsters” together was reasonably clever, and worked well in my opinion. If anything, I wanted to see more. I felt the story ended too quickly, and did not resolve itself to my satisfaction. I think this one would have been served well by being a two-issue story. Mighty fine! Parobeck was working at his peak now. Not specific to this issue, but drawing from the original episodes: Tygrus, Dorian, Romulus (wolf and human), Selina in her nighty.